“They just worm their way into your heart,” said Gretchen Beckert as she gazed fondly at the two greyhounds napping at her feet. “They’re sweet, and loving, and gentle,” she added, explaining why adopting the former racing dogs is her passion. The Goleta quilt-maker, now on her third greyhound, is part of a growing network of adoption groups for dogs whose race careers are over and who will probably be killed if they are not adopted. While there are other sources of greyhounds – some are bred to American Kennel Club standards for competitive exhibition – the dog racing industry is the primary market for large breeding farms, most of which are in Midwestern states. But the industry, which makes most of its revenue off betting, has admitted that it is in a downward spiral. According to the Greyhound Racing Association of America (GRA), an industry support group, pressure from animal rights groups and competition from other forms of legalized gambling have undercut traditional greyhound racing. Since the highpoint in 1992, in which 3.5 million people bet nearly $3.5 billion at more than 50 tracks in the U.S., revenue has fallen by nearly half and at least 13 tracks have closed, reported the GRA Web site. 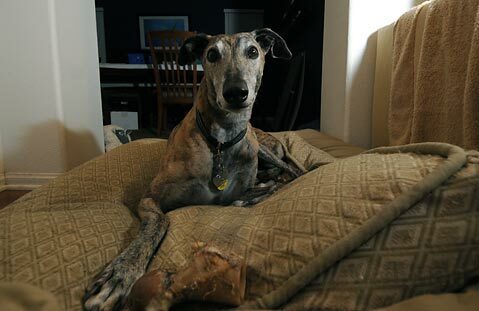 This trend increased the number of “retired” greyhounds, as the industry calls them, and spurred the growth of the adoption groups. Curiously, it does not seem to have slowed the breeding of racing greyhounds by much. In 2003, more than 26,000 pups were registered as potential racers on U.S. tracks, about 90 percent of the total newborn population. 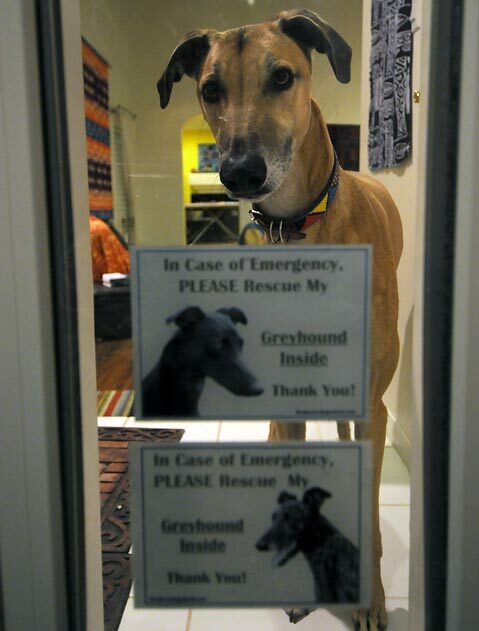 Greyhounds are tall, unusual looking canines, built for quick bursts of speed; their behavior is even more remarkable. At the risk of generalizing too much from a limited number of encounters – I’ve observed 10 different dogs for varying lengths of time, mostly former racers and all of them adopted or up for adoption – their serenity and intelligence are striking. Still, the first thing I noticed about former racing greyhounds that have been adopted by families in Goleta and Santa Barbara is how calm and quiet they appear. Their sleek, thin bodies usually do not quiver with excitement when inside a house or pen, and they seldom bark at human strangers. From what I’ve witnessed, other dogs may spark a short greeting from some of them. It is easy to forget that the ex-racers have spent years muzzled, highly competitive, and waiting in small cages to chase mechanical lures. Their calmness drew Sandra McGreevy into becoming a greyhound owner; she adopted Kenzie more than two years ago. “I was looking for an adult dog who would accompany me on my runs, but who would be independent enough to stay alone since I worked,” explained McGreevy. She happened to be at the Five Points Shopping Center when Homestretch Greyhound Rescue and Adoption staged one of its periodic “meet-and-greet” sessions to introduce people to adoptable greyhounds. Talking to Barbara Davenport, cofounder of the nonprofit Homestretch with husband Bob Smith, convinced McGreevy to try her first greyhound. However, the hound failed to pass the “bird test.” A cockatiel was living with the McGreevys at that time, and the dog had to get along with the bird. It went back to Homestretch’s kennels in Fillmore. A few months later Kenzie, who was bred but never raced, got her chance. “We fell in love with her immediately,” recalled Sandra, “and she passed the bird test – she ignored the cockatiel.” Stuffed animals, it turned out, were Kenzie’s passion. Homestretch, like other reputable adoption centers, collects as much individual background information as possible, has veterinarians check the hounds for medical problems, and restores them to health before they are eligible for adoption. Foster families and volunteers train the dogs for their new lives inside human houses, which can mean familiarizing the hounds with staircases and sliding glass doors. The families evaluate the dogs’ temperaments and help them begin a new life. It does not always go smoothly. Earlier this year, a frightened, high-strung greyhound, called Mika, was introduced to her Goleta foster family’s fenced backyard. A loud noise from a neighbor’s yard panicked her and Mika smashed through the wooden fence and disappeared. An ongoing search has so far failed to find her. Last September, however, a hound matching Mika’s dusty brindle-colored description was spotted near the Ocean Meadows Golf Course with a duck in her mouth. The search for Mika continues. If anyone sees her, call Homestretch at (805) 797-7706 or the sheriff’s dispatch.